Summer tragedy = opening the freezer to NO ice cream or popsicles. With America’s decline of musical ice cream trucks, blue stained tongues, and ice cream socials, it is imperative that we save the nostalgia of childhood summers. It is IMPERATIVE that we make these creme de menthe avocado fudgsicles. This is not a request – it is a public service announcement! For the love of all things good in the world, bring back the fudgsicles! I know I tend to be a little dramatic about my desperation for cold summertime treats, but I am passionate about the fudgy, freezie goodies. I don’t know what is is, but when a hot day strikes, I’m reaching in the freezer for something cool to satisfy. Not to say I wouldn’t EASILY go for a margarita on the rocks or anything…but you know what I mean. 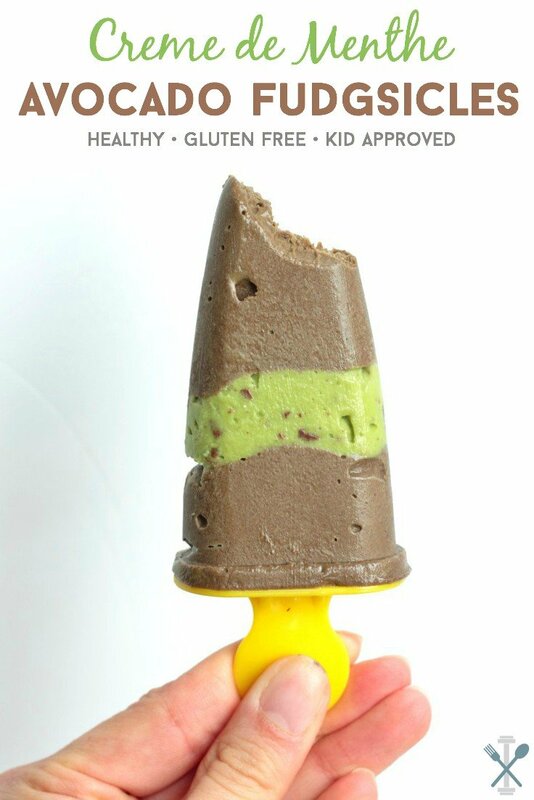 WHY NOT make a creamy, decadent, and healthy fudgsicle that you can feel good about treating yourself to, and good about treating your kids to? There’s really no excuse. You don’t even have to tell the littles they are made of avocados – they’ll never know! They also don’t have to know that mommy’s cup has tequila in it, or that you throw some of their artwork away, or that when you grocery shop alone, you feel a sense of nirvana without them. Shhhhh…. 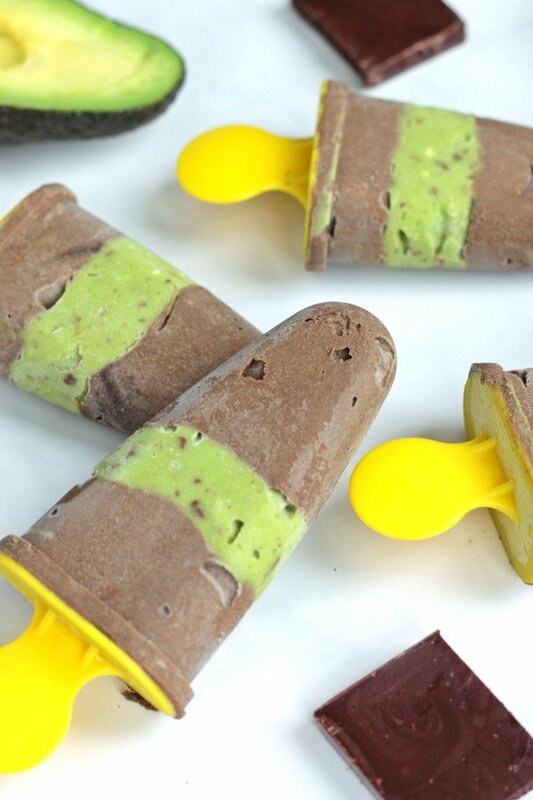 I’m so in love with these creme de menthe avocado fudgsicles I could cry. I mean, I’m hormonal as H-E-double-hockey-sticks anyway, but even the most emotionally stable person can understand how amazing these are. No preservatives, no sugar-loaded sticks of artificial colors or flavors, and no sticking to that awful pre-packaged paper. And they are SO easy to make. 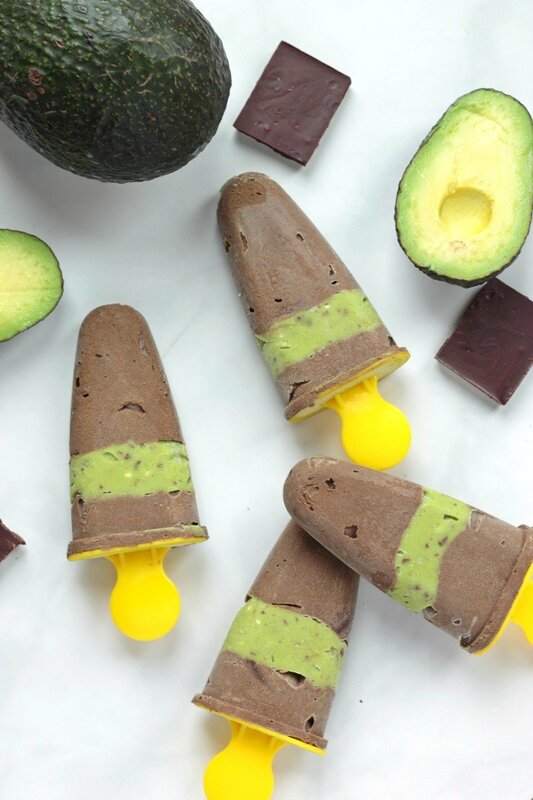 All you need are a few ripe avocados, some cocoa powder, maple syrup, dark chocolate, coconut milk, and of course, popsicle molds (you can order here). To start, scoop two large avocados into a food processor. Pulse for a few minutes until light and creamy. Reserve 1/2 cup of the avocado mixture and set aside. Add 1/2 cup coconut cream (the thick stuff at the top of the can of coconut milk), one tablespoon pure maple syrup, one tablespoon cocoa powder, and 1.5 ounces of melted dark chocolate (I used 65% cocoa) to the food processor. Pulse again until all the ingredients are well combined. Add 1 1/2 teaspoons of pure maple syrup, one tablespoon coconut cream, and 2-3 drops of peppermint oil to the reserved pureed avocado. I also added a finely chopped square of dark chocolate. Mix until well, until all the coconut cream is combined into the avocado mixture. 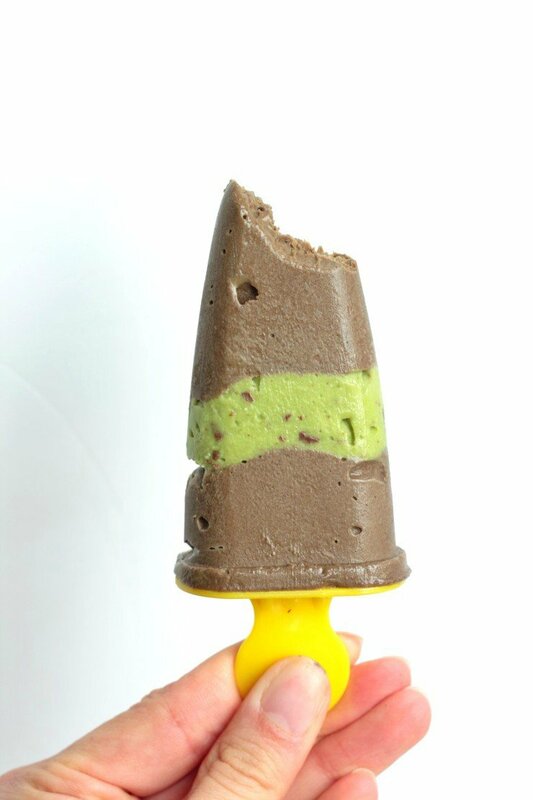 Next, scoop in 1 1/2 tablespoons of the chocolate avocado mixture into the bottom of the popsicle mold. I used a knife to swirl it down to the bottom, in order to avoid air bubbles. If you want to be neat and tidy, using your finger or a damp paper towel, rub the inside of the popsicle mold out after you’ve finished with the first layer. Next, add a small dollop (one teaspoon or so) of the mint avocado cream to the mold. Then top with more chocolate avocado cream. Freeze at least 2 hours before serving. If you have trouble getting the creme de menthe fudsicles out of the molds, simply hold the plastic mold under hot water for a few seconds and gently pull the fudgsicle out. Now the moment of truth, how many hours, I mean days will these beauties last in your freezer? It’s hard to practice self control with these decadent summer treats! Oh my gosh I’m sooo wish you. I totally dig chocolate and coconut (and chocolate/raspberry) BUT chocolate and mint is the ultimate. There’s just no comparison! oh man this is amazing! I love Ikea so much–I will also be purchasing my molds from there! I have yet to do an avocado dessert and I think this would be a perfect start! Thanks for sharing this delicious recipe! Good call – it’s definitely the perfect avocado dessert starter! Oh and I’m SOOOO with you about Ikea. Love that place. Love these!!! I have all of the ingredients in my kitchen right now, and I’ve been on a popsicle-making kick recently. Adding them to the rotation! You have some awesome molds to do them too! Perfect timing! hahaha ‘double hockey sticks.’ What a CANADIAN way to say the word hell! I love my Canadian peeps. Isn’t that a super common term?! Or maybe I just think that because my home state boarders Canada? Either way, it’s awesome. As are you. As is Snapchat…. I would have never thought to put these two together but this looks yummy! So yummy, I promise! Thanks Brittany! These sound perfect! Not only are they vegan, but they are one of my favorite dessert combinations! This is genius Chrissa! I would never have thought to put these two together. I’m definitely trying this and running to Ikea to get those molds! These sound fantastic! What a delicious and healthy treat! Oh I want to live where you live!! I love those childhood memories – you are lucky to have such a great place to raise your babies Ros! I hope you and the kiddos love these fudgsicles. OMGoodness… Making these this weekend!! 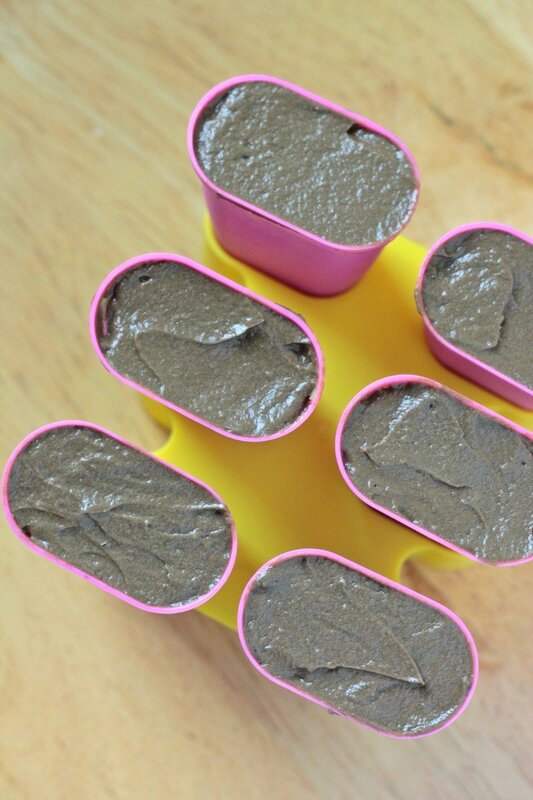 Mmmmmmmm -Using my mothers retro Tupperware popsicle molds! 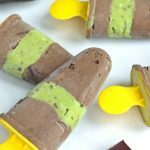 Ooooo retro avocado fudgsicles. I like it, I like it! Anything with avocado sounds fabulous to me!! I so need to make these!! Go for it Angelie! You’ll love ’em if you’re a fan of creamy avocado! Interesting combination!! They do look fabulous!! I need some of those molds!!!! For sure – especially when your littles get big enough to have popsicles! Thanks Katie. I would have never thought about this combo. It looks so good! I feel like I can also eat it without the guilt. Lol. It sure beats those fudgsicles loaded with sugar and artificial flavors! Thanks so much Adriana! That looks amazing! I love chocolate and I also love avocado, but I haven’t braved combining them yet. I have some BPA-free popsicle sticks like these so perhaps that is a sign I should make these. I saved it to my Pinterest and Yummly accounts for future reference! Thanks so much Sam! Trust me, this combo is something you have to brave it out and you’ll be sold! Thanks so much for the pin and yummly love. YES!!! Bring back the fudgsicle!! These look so flippin’ good. I’ve been waiting for you to share this post since I saw it on Snapchat ( i think??) maybe it was twitter or facebook.. Either way. I’m totally making these! okay, so I cannot lie but the avocado part kind of weirds me out, but you are my go-to food guru so I totally trust that these are delicious as you say they are! I’m pinning these so I dont have one of those open the freezer moments this summer! LOL! Don’t let it weird you out, promise! 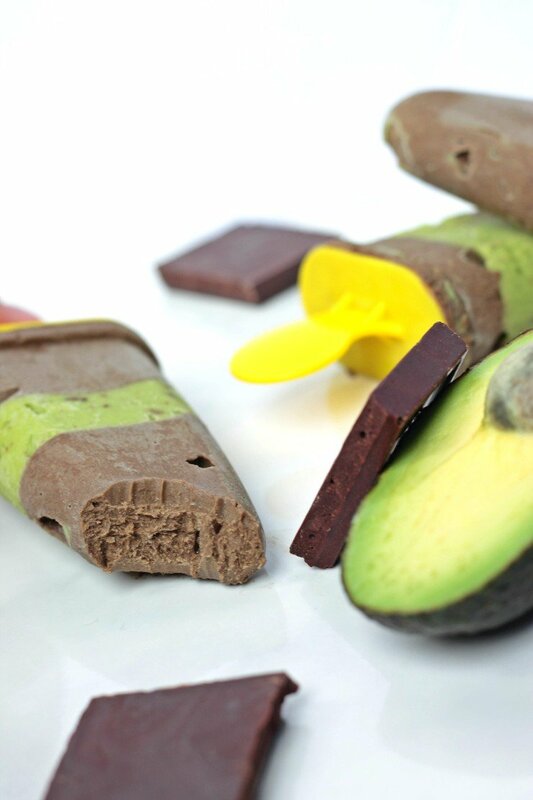 Avocado has such a mild flavor, it really is transformed with the cocoa and dark chocolate. I really do hope you try these Kristen! You’d love ’em! Mouth is officially watering! I just used coconut cream in a frosting yesterday and OH EM GEE. When I told Drew I ate half a cup of frosting yesterday I think he thought I was kidding… Buutttt I wasn’t, heh. I seriously must try these! Once we actually move and can unpack my popsicle molds..
DUDE I’ve sooo been there. No shame! I used a coconut cream frosting for my son’s first bday cake – yes, amazing. Get unpacking lady – you’re gonna like these! Coconut cream seems like it might make fudgier icecream than regular ice cream. These are lookin’ so good right now. I’ve never made fudgsicles. Y’all are always surprising me with your amazing creations. Those sounds amazing! I can’t wait to eat these on a hot day. That is a fantastic idea! Thanks for the pin love Casey. Mmm. Mint chocolate is my favorite flavor combos. I’ve never tried using avocados like this, but I’m certain it would make these super creamy. Guess I’m spending my lunch break at Ikea on Monday. That place never ceases to amaze me. Hey Jessie. Thanks for stopping by! You would love this. 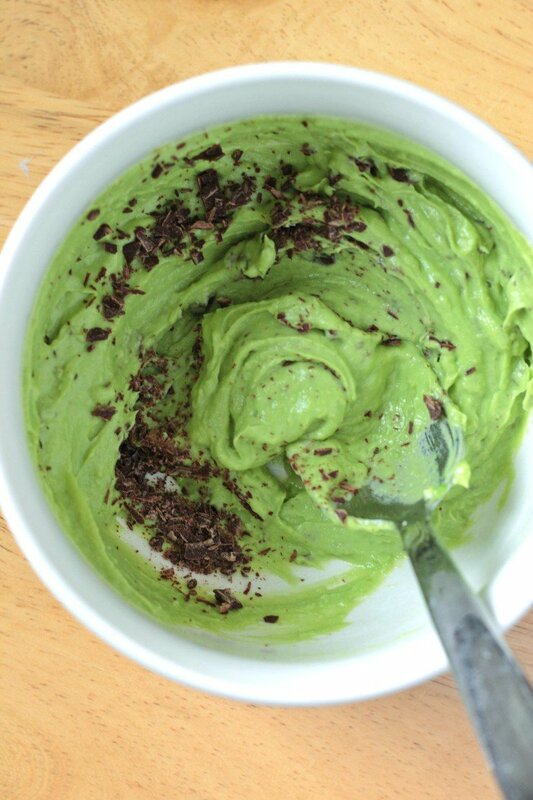 I have made avocado chocolate pudding and it’s soooo sinfully good (yet healthy – yay!) Who DOESN’T love Ikea?! Yum! So pretty and they sounds delicious. As soon as I’m done with the Whole30, I’m making these. Definitely will be saving this to make in the future. I have also made an avocado and cocoa powder shake with ice and evaporated milk and sugar. Not quite as healthy perhaps, but SO good. That DOES sound so good. Anything with avocado as a base makes such a rich, decadent dessert! Thanks Lydia – hope you love these! I need to hop on the popsicle train this summer!! I forsee so many cool ideas for flavor combos and such, like THIS recipe!! SO MANY right?! I mean, it’s so effortless with so much summer fruit to just puree and throw into a mold! !